Docking a node is a way to reduce clutter in a network by hiding an operator as a small dock icon on another node. This icon is color-coded to indicate the Operator Family of the docked node. Any node can be docked to another node. When a dock pa ent node is moved in the Network Editor, the docked node moves with it as well. Docking does not affect the nodes' behavior, only the look. A docked node is often docked to a related node to help with network organization, an example is the Ramp TOP. A new Ramp TOP is created with a docked Table DAT that stores the ramp color information. To view the Table DAT, click on the DAT-colored dock icon attached to the lower-right corner of the Ramp TOP. Click on the icon again to collapse the docked node back down to an icon. - Right-clicking on the node to be docked and select Dock to ..., then click on the node you want to dock to. - Using Op.dock and Op.docked in python for the Operator class. Any node can be docked to another node. 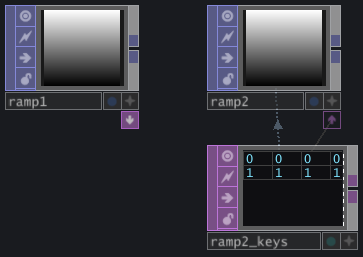 This helps organize networks as two node that are docked together will stay together when the dock parent is moved in a network editor. A docked node can be collapsed into a small icon under the dock parent, reducing network clutter. This page was last edited on 12 November 2018, at 17:46.